Taking place at night and usually free, spectacular light-and-sound shows are great entertainment for the whole family. There is good news for those who enjoy such spectacles under the stars: Three new shows will be launched during the June holidays. The multimedia show Spectra, a showcase of laser, light, music, water movements and visual images, starts today at Marina Bay Sands. It takes over the previous show, Wonder Full, which ended in April after a six-year run. Mr George Tanasijevich, president and chief executive officer of Marina Bay Sands, says: "Six years is a long run for any production and we are thankful we had the support of so many visitors for this free public show." The show attracted about 31,800 visitors a week. He adds that while Wonder Full had a storyline, Spectra will be less thematic, with more focus on spectacle. He expects the multi-million-dollar project to draw thousands of visitors to the event plaza each week. Meanwhile, to add razzle-dazzle to its fifth-anniversary celebrations, Gardens by the Bay will have a different version of its nightly Garden Rhapsody show for this month only. The new show is called Gardens Extravaganza, which maps colourful images across the full heights of eight Supertrees, measuring 25 to 50m tall. This weekend, there will be a special edition, with live performers. The Gardens' director of programming, Ms Ong Chui Leng, says: "We wanted to come up with a show on a scale that has never been done before at the Gardens." Through 3D projection mapping, the show tells the story of the Gardens' growth, from the seed of an idea to the iconic attraction it is today. Meanwhile, Merlion Magic Lights, a light-and-sound show featuring the Sentosa Merlion at Merlion Plaza, will have a new edition this month. The theme will be based on MegaFun, in line with a series of programming in Sentosa that celebrates anything that is fun for everyone in the family. The Straits Times checks out the light-and-sound shows in town. What: Produced to celebrate Gardens by the Bay's fifth anniversary, this show tells the story of how a man enters a magical world, where wonders bloom. It is told through 3D projection mapping, where images of stars, plants and water droplets are projected onto the full heights of eight Supertrees, each 25 to 50m tall. The projections play out against a celebrative soundtrack featuring various genres, including orchestral and new-age music. There will be a special show this weekend, where aerial performers, fire twirlers, stilt walkers and dancers perform on makeshift stages. Their choreography will be synchronised with the images on the Supertrees. Adding to the visual spectacle are special effects, such as thousands of bubbles from six machines and bursts of fire from more than 30 flame machines mounted on the 22m-high OCBC Skyway aerial walkway. The show will end in a display of fireworks and a band of 50 drones dancing across the sky to create six formations, including a supertree image, a flower and a smiling face. Facts: The show was produced in partnership with home-grown company Hexogon Solution, which has done video mapping for the National Day Parade and SEA Games. Video mapping, which is usually done on flat surfaces, is technically challenging on plant-clad Supertrees, as the graphics need to be calibrated to show up on uneven surfaces. To map effectively on the Supertrees, 32 high lumen projectors are used, the same as would be needed for a show like the National Day Parade. What people say: Sales executive Jason Teo, 34, was at a preview of Gardens Extravaganza Special on Tuesday with his wife and two sons, aged three months and two years. They were on their weekly trip to catch the Garden's usual Garden Rhapsody show and chanced upon the preview. "I love the projections. They make me feel like I am in an enchanted forest. The drone display is also very nice, especially the smiling face at the end." What: This multimedia show begins dramatically, with lasers beaming down from the top of Marina Bay Sands onto a 12m-tall glass-and-stainless steel prism floating on the waterfront. This sets off water jets and spectacular lights and effects. The water jets create stunning fountain effects, such as pyramids and gyroscopic arcs, as well as lava and mist effects. The prism, which has more than 60 lights inside, forms the heartbeat of the show, pulsating to the beat of the music and changing colours like a kaleidoscope. The action is set to an original orchestral soundtrack composed by Singaporean music producer and composer Kenn Chua, known as Kenn C in the local music industry. Facts: The show is designed by Australia-based experience agency Imagination. It designed the light-show and firework components of big shows in Australia, including Sydney New Year's Eve, the city's official celebration and biggest public event. Imagination and MBS took two years to produce Spectra. More than 110 types of LED lights and lasers are used and underwater LED fixtures were specially developed to allow lights to show perfect whites and richer colours. Other state-of-the-art technology used include a synchronisation software called timecode, which enables the soundtrack to trigger, down to the millisecond, all the lasers, lighting, projections and water effects in harmony each time. The show is also energy-efficient. Besides the use of energy-saving LED lights, the production's water effects are powered using water from the bay, which is filtered and recycled with each performance. What people say: Ms Ong Suat Har, 52, a quantity surveyor who was at the preview with her two nephews, aged 16 and 19, said: "I enjoyed the end, where the music was very rousing and the waterworks very lively and exciting. It made me want to stay on and watch some more." 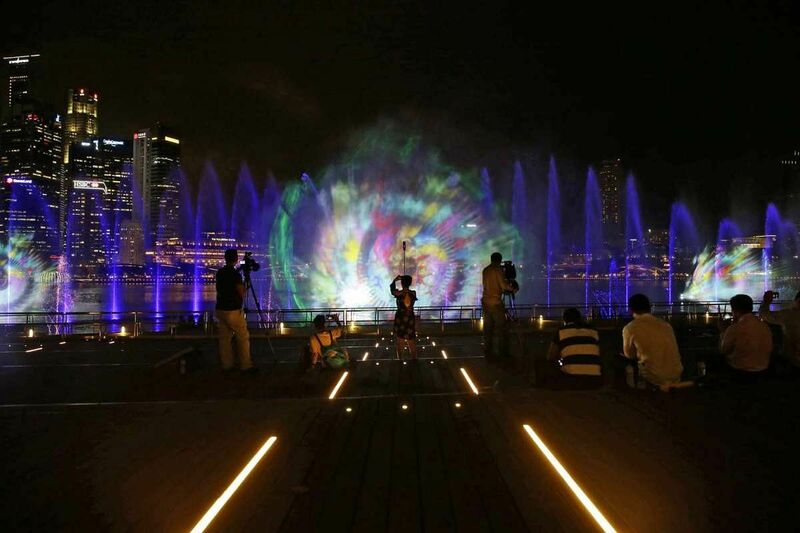 What: In this light-and-sound show, the 37m-tall Sentosa Merlion will turn into a canvas for 3D video animations, featuring fun activities for the family, including pinball games, drawing and painting. The show is based on the theme of MegaFun, in line with a series of programmes in Sentosa these June holidays, celebrating fun activities for the family. 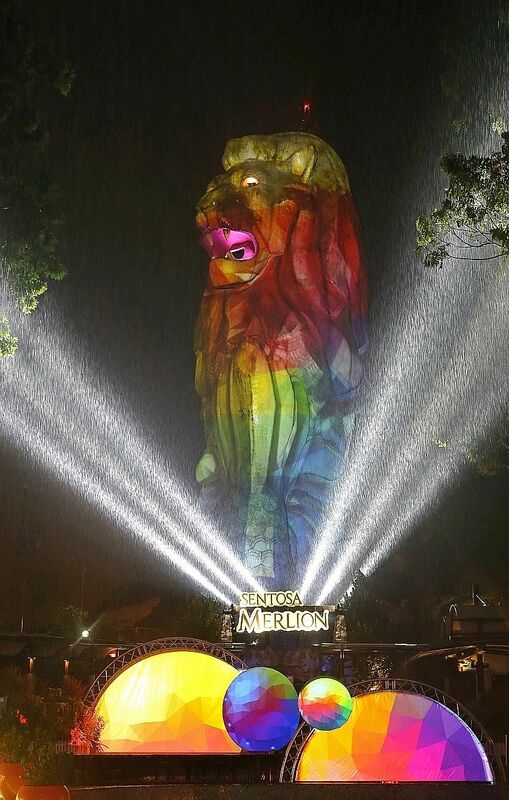 Facts: The Merlion Magic Lights was launched in 2013 by Sentosa Development Corporation and Hexogon Solution to celebrate Sentosa's 40th anniversary. Up to four editions are showcased a year, each based on a different theme. Each edition takes more than 10 people over 10,000 man hours to plan, design and execute. What people say: Marketing director Desmond Goh, 34, watched the show's first edition with his family and hopes to catch another soon. "I was amazed by how the usually passive-looking Merlion was transformed." What: The show follows the courtship of two giant mechanical cranes and how their love for each other transforms them into "real" birds that bless the world with love and good fortune. In Chinese tradition, cranes symbolise longevity, abundance and good luck. The story is told using digital art, water, lighting and sound effects as well as fireworks. Facts: Launched on Dec 25, 2010, the Crane Dance was designed by American company Entertainment Design Corporation. At full extension, each crane is 30m tall, or the height of a nine- storey building, making them possibly the world's largest dancing animatronics. The hydraulic-powered cranes, with joint movements that mimic those of the red-crowned crane, are installed on a fixed barge, a distance away from the shoreline for optimal viewing. Attached to each crane are large 8 by 8m LED panels carrying animated displays, to support the emotional narrative of the show. What people say: Mrs Hazlyn Koul, 27, who works in corporate communications, has watched the show a few times, most recently last December. "It's interesting to see how technology can bring to life something so mechanical," she says. "I am impressed by the way the crane machines bend and move and are able to show some form of love and emotion for each other." What: With Siloso Beach as its backdrop, the show operated by One Faber Group tells the story of Shahbaz, a pre-historic bird-like creature, which, together with its human friends Rachel and Felix, travels back in time through the Industrial Revolution and the Silk Road era, as well as to the Mayan Pyramids and the African Savanna. 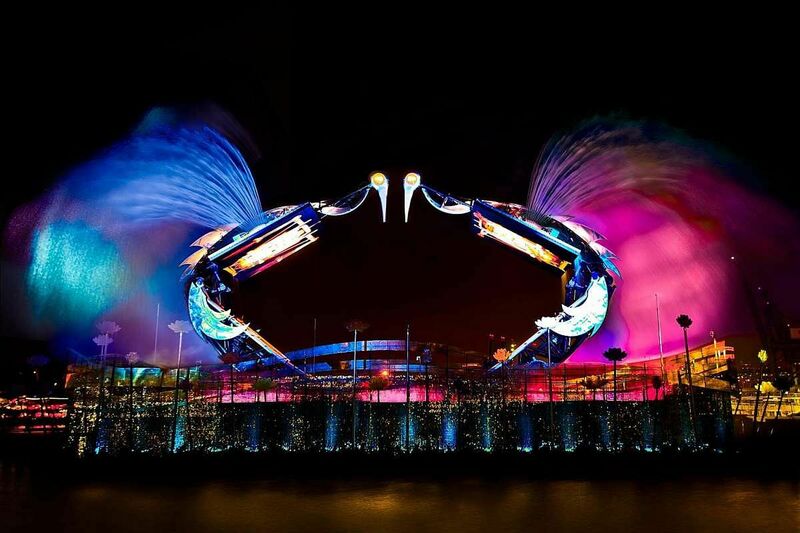 It is told using 3D video mapping, lasers, dancing water jets, flame effects and fireworks. Panoramic vistas are projected on a 60m-long and 20m-tall water screen, which stands over the waters. It is made of nine triangles, inspired by the wings of Shahbaz. Facts: Launched in June 2014, the $10-million production took a team of about 150 professionals two years to conceptualise and develop. The production work by ECA2, a French events company, took another six months. It is the No. 1-ranked show in Sentosa on the Tripadvisor website and has drawn more than 2.5 million people since its opening. What people say: Mr Pankaj Sutar, 40, a lawyer and tourist from India, watched the show on Tuesday night with his wife and 21/2-year- old daughter. "The show is very colourful. I especially enjoyed the waterworks and fireworks," he said.